Is there any state or federal land in Texas where you can go target shooting or plinking without advanced permission? I watch NutNFancy's YouTube channel where he often goes to the Utah desert for target shooting. I assume that's federal (BLM) land? kbriggs wrote: Is there any state or federal land in Texas where you can go target shooting or plinking without advanced permission? I watch NutNFancy's YouTube channel where he often goes to the Utah desert for target shooting. 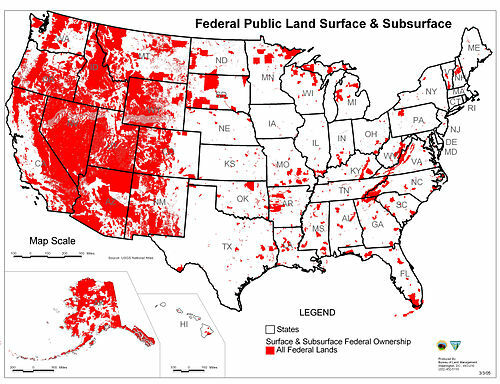 I assume that's federal (BLM) land? It is too tough if not available in Texas to find public land to target shoot on it. Years back in East Texas, the various paper companies had sections of land they designated as "usable" for camping, hunting etc. These parcels rotated. One could get a good set of maps. We spent a lot of time out on these lands over the years past. However, I believe these lands were turned over to the TP&W for management and are now called Type II lands. Anyone use these and know the specifics on their current accessibility and use ? Beaches in Texas are considered State owned public land. I think if you are in an unincorporated area, and are far enough away from buildings and roads, It should be legal to shoot there, I haven't worked up the courage myself to try it out though. Liberty wrote: Beaches in Texas are considered State owned public land. I think if you are in an unincorporated area, and are far enough away from buildings and roads, It should be legal to shoot there, I haven't worked up the courage myself to try it out though. I think this would be OK, especially along Follett's Island north of Seaside, and on Galveston Island to the west. Galveston ordnances says something about prohibiting shotguns only in certain areas, implying other areas OK. I thought that would be a good place to shoot clays. I called around to various agencies and police departments some years back trying to find out the same thing anywhere near Houston. I got so much conflicting information and non answers that I realized police in each area likely didn’t have a clear understanding of where it would or would not be legal. My assumption is that even if you found somewhere that should technically be legal there is a high chance you’d still have police involvement if someone inevitably calls. I determined it wasn’t worth the hassle and risk. Unlike western states with hundreds of thousands of public land where one can legally target shoot for free, the only public land I’m aware of in Texas where you could do the same is in a small area in the LBJ Grasslands where you could only shoot shotguns, no rifle or pistol. That was a few years ago when I last checked. Things may have changed since then, but I doubt the change would be for more permissive target shooting. I wouldn’t be surprised if even shotgun shooting were now prohibited. You should call the LBJ Grasslands Forest Rangers Office to check. I would also get a copy of any Forest rules that allow any kind of target shooting and strictly adhere to them. You may also want to call and check with Rangers offices at the Davy Crockett and Angelina National Forests to see if any target shooting is allowed. But last time I checked it wasn’t. If it is now allowed, I would ask for a copy of any Forest rules that specifically allow for it and designate exactly where it is allowed, when it is allowed (could be seasonal so as not to interfere with any hunting season), and what calibers and firearms are allowed or prohibited. Even then, I would exercise extreme caution and strictly adhere to any rules and designated shooting areas. I’m not aware of any target shooting in any state-owned lands. I don’t know whom you could call to check on that, though. Might want to check with the Texas Parks and Wildlife Dept. and the Texas General Land Office. Again, if any target shooting is allowed on state-owned land (I’d be surprised if there were), I would get a copy of the rules allowing for it and would strictly adhere to those rules. If your search does find any public lands that allow target shooting, please let us know. I have never been, but there are places along the Canadian River bottom north of Amarillo that people go to legally target shoot. There are rifle ranges open to the public around, but not too many.